Please join us for a gathering that is sure to be filled with creative, unexpected twists and turns and a rousing group of active citizens. Preserve Floyd: Citizens Preserving Floyd County will host a community meeting at the June Bug Center on Sunday, December 14 from 3-5 PM. Please join us to explore how we can preserve, protect and enhance the environment of Floyd County, how we can proactively work together to address any future threats that might come our way, and how we can support our friends and neighbors in surrounding counties in their work to keep the dangerous and unwelcome Mountain Valley Pipeline out of their communities. Citizens Preserving Floyd County is a grassroots community endeavor that intends to listen, respond to and participate with the citizens of Floyd. We want to hear your ideas for the future. We want your voices in the mix and your presence at the table. We’d love your help if you have volunteer time you’d like to offer! We intend to foster discussion about how we can continue to PRESERVE FLOYD and also help to Preserve Roanoke County, Preserve the NRV, Preserve Franklin, Preserve Giles, Preserve Pittsylvania, Preserve Montgomery, Preserve Virginia and West Virginia and safeguard our resources as a global community. NOT IN OUR WATERSHED.WHAT WE STAND ON IS WHAT WE STAND FOR. COMMUNITY IS STRONGER THAN CORPORATIONS. Sunday, December 14 from 3-5 PM at The June Bug Center. We hope very much to see you there. You can RSVP to the event and find more information HERE. CPFC pipeline meeting July 17, 2014 at the Floyd Country Store. (Photo by Larry Tueller). 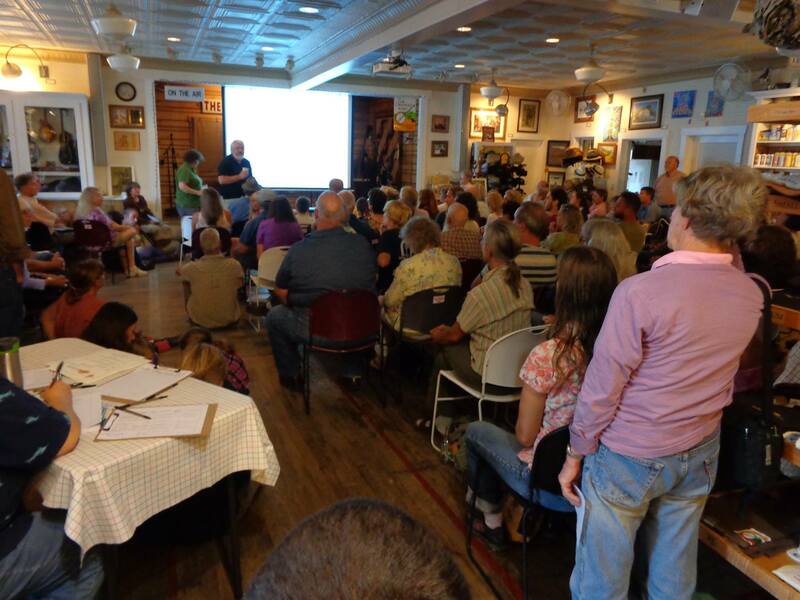 An overflow crowd came out Thursday July 17 to the Floyd Country store to hear a briefing and express views about the Mountain View Pipeline proposal recently floated by a Pittsburg-based company EQT. News coverage included the Floyd Press article by Wanda Combs and the Blue Ridge Muse article by Doug Thompson.